Our activity centers offer classes to stimulate aging minds, including art, music, computer, smartphone and tablet courses, travelogues, foreign language, brain fitness, mindset tools to manage memory loss and courses on how to age wisely. For individuals who love to explore current events and other topics, we also offer creative conversations. Creating art is a wonderful form of self-expression. It’s also good for hand-eye coordination and self-esteem. 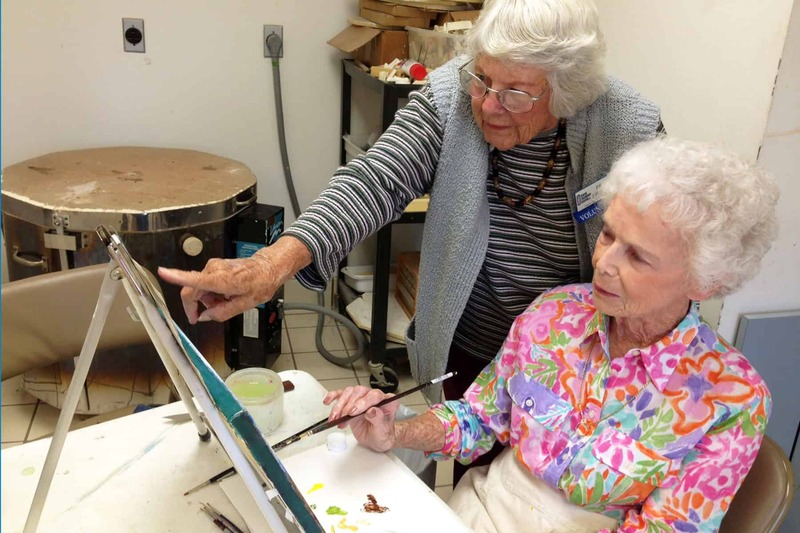 There are many art classes to choose from at the Friendship Centers, and depending on the season, we offer classes that may include ceramics, watercolor, acrylics, quilting and woodcarving. We also offer harmonica classes, karaoke and singing with the Friendship Chorale in Sarasota and the Friendship Singers in Venice. Learning a second language is not only fun; research has shown that it can stave off the effects of Alzheimer’s and dementia by years. Our students love to learn Italian and French, and immerse themselves in the culture of the land. We also offer Dakim, a structured and evidence-based, computerized program to help people over 50 improve memory, attention, focus and concentration. Dakim works out six parts of your brain in 20 minutes, and it’s fun, too. Mindset is a series of four classes designed to help individuals and care partners manage early stage memory loss through research-based exercises. Check out the calendars for the current schedule of classes or read the latest issue of Prime Times. For details about classes and other educational programming, see our Learning section.